Pest description and crop damage Apple grain aphid is light green with a distinctive green stripe down the middle of the back. Apple grain aphids infest apple buds in the early part of the season, often becoming apparent at green tip. 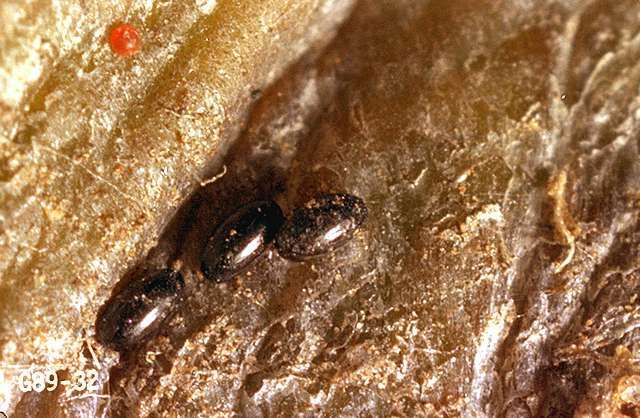 Apple grain aphid is typically not economic and its early appearance may jumpstart aphid natural enemy populations. Green apple aphid is dark green and is present throughout the growing season on foliage. 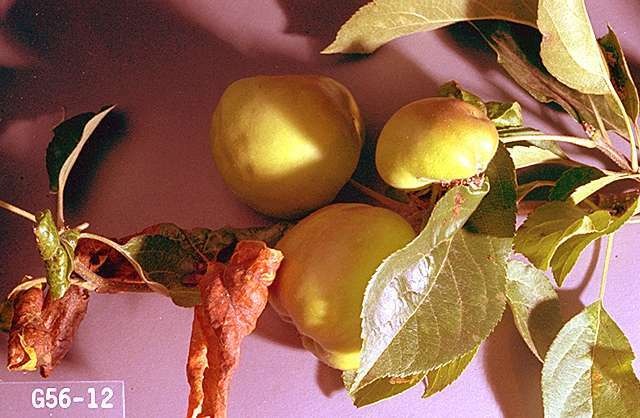 It may be more problematic on green and yellow apple cultivars. Heavy populations can feed directly on the fruit, which may be marked, or honeydew can cause sooty mold marking. Rosy apple aphids are rose-purple. Their feeding causes severe leaf curling, along with honeydew and sooty mold. Fruits of certain varieties can be stunted and deformed by early-season feeding. The best time for control is before bloom. 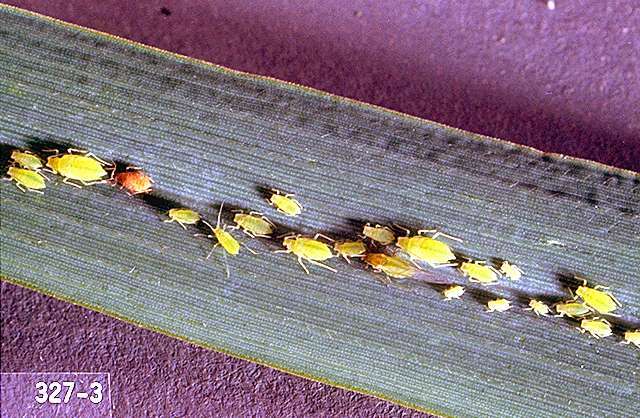 Once leaves are severely curled, aphids are extremely difficult to kill. Scouting and thresholds Begin observing growing shoots in late May as shoot leaves are expanding rapidly. About four to five infested leaves per shoot indicates a problem. 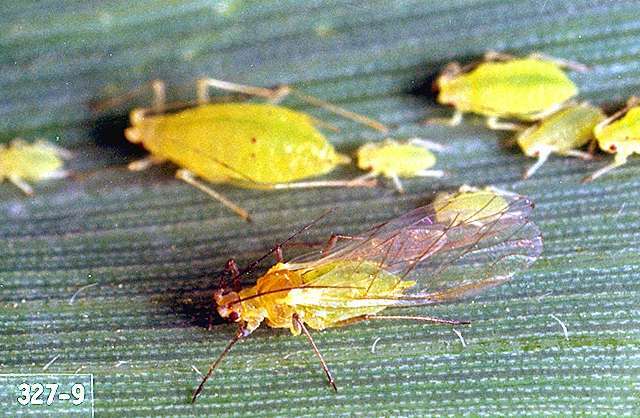 Aphid identification is necessary to guide treatment decisions as apple grain aphid and green apple aphid are typically less damaging. Aphids have many natural enemies including lady beetles, syrphid fly larvae, green lacewings, and parasitoid wasps. Avoid broad-spectrum insecticide applications that disrupt these controls. Aphid populations tend to be higher in plants that are fertilized liberally with nitrogen because aphids prefer succulent new growth. 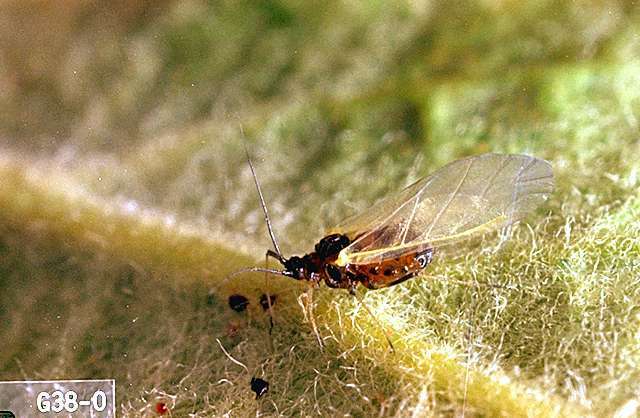 Home orchardists: Wash aphids from plants with a strong stream of water or by hand-wiping. Apply sprays during dormant or delayed-dormant period (March to April). Do not use after pink appears in buds. Use enough water to cover the entire tree thoroughly including small limbs and shoots. Once leaves have become severely curled, control is very difficult. Do not apply after blossoms open. Beauveria bassiana-Some formulations are OMRI-listed. kaolin-Applied as a spray to leaves, stems, and fruit, it acts as a repellant to target pests. Some formulations are OMRI-listed. 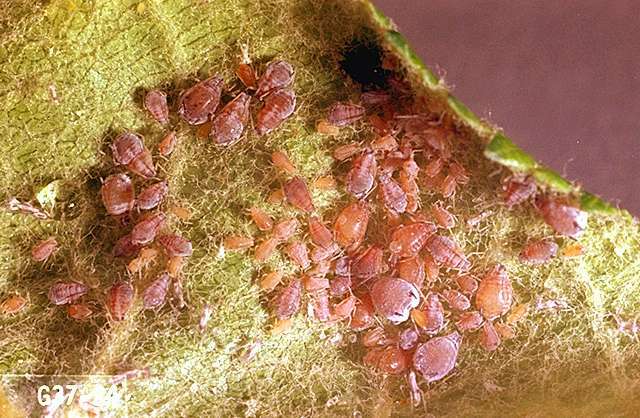 plant-derived essential oils-Some have shown efficacy against aphids. Some formulations are OMRI-listed for organic use. Narrow-range horticultural mineral oil at 6 to 8 gal/a in up to 400 gal water. REI varies by formulation; see label. Some formulations are OMRI-listed for organic use. lime sulfur (Ca polysulfide)-Formulations vary; see label for rates. May be mixed with horticultural mineral oil at 6 to 8 gal/a in up to 400 gal water. REI 2 days. Some formulations are OMRI-listed for organic use.